You can select a specific area in your preview image to include in your scanned image. You can select the entire image area or a portion of it. You can even select multiple scan areas to create multiple scanned images of different areas. You can also use the scan area to select specific Image Adjustments settings for a scanned image. Just be sure to click inside the scan area before selecting the settings. In the Preview window, click the Auto Locate icon to create a marquee (dotted line) on the preview image. If the marquee is correct, continue with the next step. To create additional marquees (up to 50, if available), click the Copy Marquee icon to copy the existing marquee and paste it on the preview image. Note: If you draw multiple marquees, make sure you select the All button in the Preview window before you scan. Otherwise, only the area inside the currently selected marquee will be scanned. To delete a marquee, click the marquee, then click the Delete Marquee icon. To rotate your original in your scan, click one of the Rotate icons. 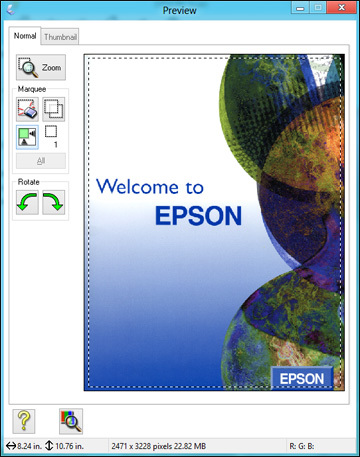 Click inside each scan area and make any necessary settings in the Epson Scan window.